Read the warning or read the poetry! The moose is a mighty animal indeed and one to be respected especially by those unfamiliar with its ways. Pay attention to highway signs in Vermont and elsewhere in northern New England. A moose sign means what it says and carries additional weight these days because the moose population is expanding. If you are traveling at night be especially careful and stay alert. The hair on a moose is not reflective. The eyes don't sparkle in headlights either. If you are traveling at more than 45 mph it is unlikely that you will avoid a collision with a beast that may weigh 1,000 lbs. Speeders are likely to be greeted by a moose flying through their windshield. In that event, the only recourse is to duck behind the dash. Don't think that a busy interstate offers safety. Interstate I-91 at Sheffield Heights, just north of Lyndonville is definitely moose country with the animals obviously regarding the highway as "their territory." The same goes for Bolton Heights on I-89. Moose collisions -- there were 155 moose killed in collisions with cars in Vermont last year. This figure includes 50 collisions on Interstate 89 & 91. Moose collisions cost the taxpayer as well. Game wardens are often called out in the middle of the night to eviscerate the animal at the scene and truck the carcass to a slaughterhouse. With the moose possessing four stomachs as well as heart, lungs and liver, it is not a pleasant job to be doing at 2.00 am! Wildlife specialists point out that the moose population has increased during the past 20 years as woodland and wetland habitats have grown and hunting and trapping regulations have changed. It's estimated that there about 2,500 moose are roaming Vermont these days. Some of them even roam urban areas causing much consternation among the state's urban dwellers, who upon occasion, have been known to ask where milk comes from. In addition to a growing herd size, moose habits explain why there is a greater risk for moose/motor vehicle crashes between April and October. For instance, in the spring and early summer, moose crave salt. Spring runoff on roadways that have been deiced with salt become a great sodium source. Moose yearlings that are abandoned by their mothers in the spring and summer months often wander into roadways as they try to manage on their own. During mating season in September and October, moose activity is increased and they are on the move. Moose size and speed -- they can weigh up to 1,200 pounds and trot as fast as 30 mph -- makes it possible for them to move rapidly but that momentum makes it nearly impossible for them to stop quickly or swerve. Also, unlike most wildlife, moose do not respond by fleeing and just stand in harm's way when threatened by anything -- including oncoming vehicles. Moose hunting in Vermont is strictly regulated, but a recent change to the regulations will likely result in more of them being shot. 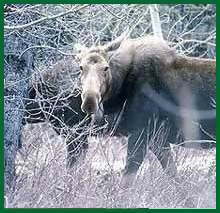 Landowners who can prove to the satisfaction of Fish and Wildlife officials that a specific moose is repeatedly causing substantial damage will receive permission to shoot the animal.